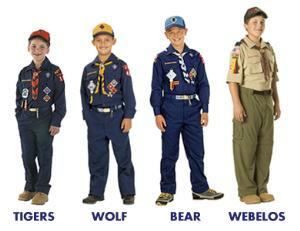 The "Class A" uniform is an important part of the Scouting program. It identifies the boys with their rank and gives them a sense of belonging to a den, the pack, and Boy Scouts of America. Scouts enjoy wearing their uniform. They should wear it to all den meetings, pack meetings, and special pack activities. 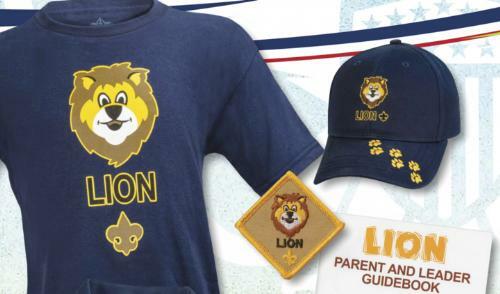 For more information regarding patch and award placement, please refer to the Cub Scout Insignia Guide. 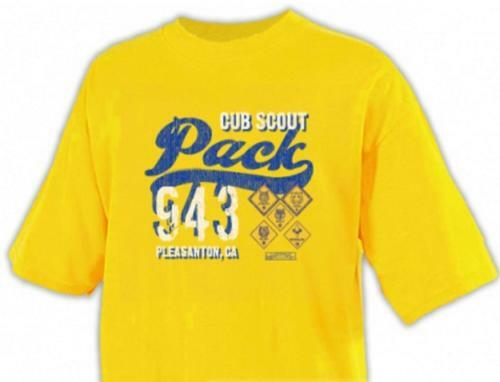 Shirt - The official uniform shirt is available with long or short sleeves and has button-flap pockets and "Boy Scouts of America" lettered in gold above the right pocket. *Tucked in*. Belt - Official navy-blue web belt with metal buckle and Tiger, Cub Scout, or Webelos Scout emblem. Socks - Official socks are optional. Official BSA neckerchiefs are the only neckerchiefs boys should wear. Packs should not make their own pack neckerchiefs for boys. Neckerchief slide—Official gold-tone metal slide with the Tiger, Wolf or Bear Cub Scout, . Boys may wear handmade neckerchief slides. Shirt - Official Boy Scout tan long- or short-sleeved shirt with blue shoulder loops. *Tucked in*. The "Class B" uniform is a Pack specific T-shirt that is sold primarily at the beginning of the school year. These T-shirts are worn at field trips, camp outs, Go-See-Its, and sometimes Den Meetings. 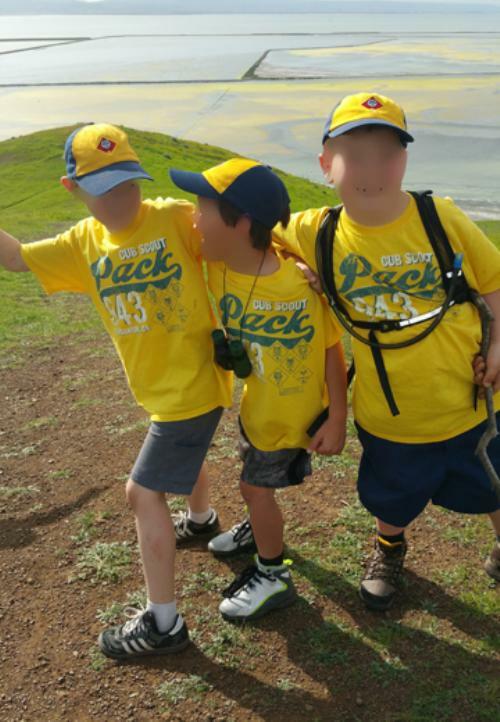 They help identify the boys as being a part of our Pack 943. There are Class B uniforms available in adult sizes as well! Submit your order now! Our goal is to submit a bulk order. Next Pack order will be submitted around September/October. Contact Pack or Den Leader for next signup information. For Scouts and Leaders. Parents, Adult Partners, and siblings are also welcome and encouraged to order and wear. Youth Extra Small XS 2 4 16" 21.5"
Youth Small S 6 8 17" 23"
Youth Medium M 10 12 18" 24.5"
Youth Large L 14 16 18" 26.25"
Youth Extra Large XL 18 20 20" 27.75"
Adult Small S 18" 28"
Adult Medium M 20" 29"
Adult Large L 22" 30"
Adult Extra Large XL 24" 31"
Adult 2X Large 2XL 26" 32"
Adult 3X Large 3XL 28" 33"
Adult 4X Large 4XL 30" 34"
Adult 5x Large 5XL 32" 35"
Ladies X-Small XS 16" 23.5"
Ladies Small S 18" 25"
Ladies Medium M 20" 26"
Ladies Large L 22" 27"
Ladies Extra Large XL 24" 28"
Ladies 2X Large 2X 26" 29"
Ladies 3X Large 3X 28" 30"
Questions: Please contact Joyce Fink at 303-246-4512 via cell or text.